This month, a freight train carrying crude oil from North Dakota derailed in northern Illinois, near the town of Galena – and close to the Mississippi. Five of the cars burst into flames and burned for days. Thanks to the great work of federal, state, and local officials who responded to the derailment, the situation was contained and, thankfully, no one was hurt. Transportation accidents like the one in Galena remind us how important it is to have modern infrastructure and state of the art transport equipment. A long-term transportation bill is critical to improve our mass transit system and build roads and bridges that will spur economic development. After President Obama’s State of the Union, I said that one of the first bills the 114th Congress should take up is one that renews our federal transportation programs, long-term. At the end of May, funding for the Highway Trust Fund faces a deadline. The fund accounts for 75 percent of Illinois’ annual transportation spending and without Congressional action, it could impact construction projects across our country. Infrastructure needs are far greater than the revenue gained to fund them. The American Society of Civil Engineers graded our nation’s infrastructure a D+. It is up to Congress to replenish this fund and it should be done by passing a comprehensive, long-term federal transportation bill. 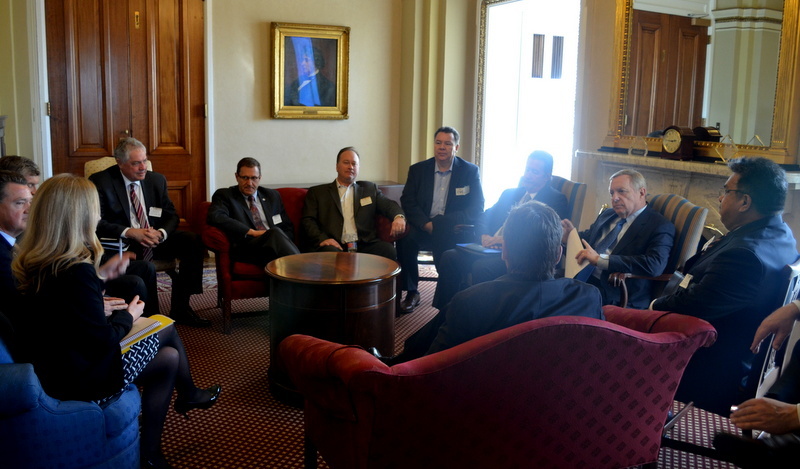 This week, I sat down with members of the Illinois Road and Transportation Builders Association (IRTBA). The IRTBA, comprised of contractors, suppliers, and design firms, help construct Illinois’ highways, transit systems, railways, and aviation systems. Their hard work fuels our state’s economy. During our meeting they made it clear to me how important it is for Congress to pass a long-term federal transportation bill. They told me that certainty is key: short-term, stop-gap measures don’t cut it. At best it puts a band-aid on our problems. A long-term solution allows for better planning, more job certainty, and the most cost-effective solutions. Their operations depend on it and so does Illinois. I also met with transit leaders from the Regional Transportation Authority, including Northeast Regional Chairman Kirk Dillard, who had the same message: pass a long-term bill. They depend on the same certainty of investment to maintain and operate tracks, buses, and rail cars. Millions of people across Illinois depend on transit to get to work on time and safely, and a lapse in funding would cause significant disruption to services. improvements may be disrupted. President Boardman and Chairman Coscia expressed their support for Amtrak in Illinois to me and I will continue to fight to improve Amtrak service and keep it up to speed. The last thing Americans need now is another manufactured crisis to disrupt lives, and that’s why the Senate shouldn’t waste any more time before passing critical transportation bills. We can do it in bipartisan fashion as it has been historically. Let’s keep America on the right track, infrastructure projects alive, and our economy’s motor firing on all cylinders. If you did not sign up to receive this email or no longer wish to receive future updates, please click here to unsubscribe.